Fear and anxiety are two things that can quickly derail even the most organized and secure people. They can strip us of our confidence and stop us from achieving all that we were meant to do. Few people know the daily struggle I personally face with severe anxiety. Not a day goes by that I don’t have to employ some of the coping mechanisms I’ve learned throughout the years just to keep my breathing or heartbeat regulated. I often laugh at the fact of how I speak regular in front of hundreds of people and before every single presentation I get sick to my stomach and have to work to keep from throwing up! Anxiety (and fear for that matter) is something that if left unchecked can quickly overtake me. It can take control of my body and keep me from being who I’m working to be. It’s caused me to be hospitalized and has even kept me from sleeping for entire nights. 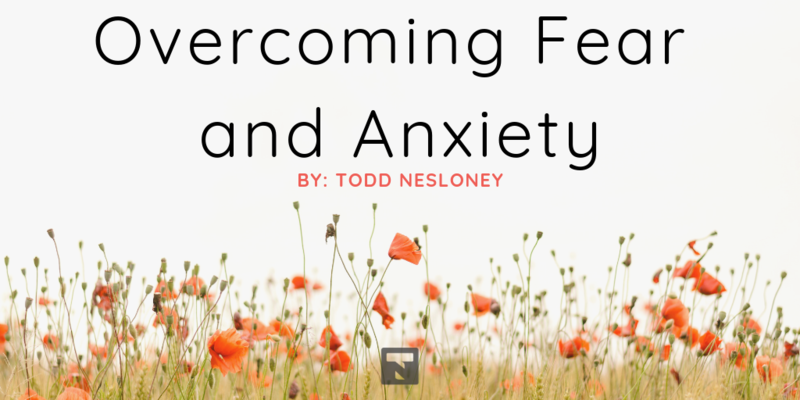 But anxiety, just like fear, can be overcome. It can be challenged and faced head on. But it’s important to remember that it’s not a one-time fight. It’s a battle that every day when you awake you have to make a conscious decision that you’re ready to fight back. When we allow that fear and anxiety to take control, what we’re really doing is choosing to believe the lies we tell ourselves. We aren’t keeping our focus on the truth of who we are and what we’re capable of. I often find that anxiety and fear gains its strongest grip on my life when I shut others out. When I either convince myself that I can do it alone, or when I tell myself that I am unworthy (or that others could care less) about wanting to help or walk alongside me. And sometimes, the anxiety and fear are two beasts we can’t tame on our own now matter how hard we try. For some of us we have to take medication or attend counseling sessions. And guess what? That’s ok! What matters is that you get the help you need, when you need it, in the way that is most beneficial to you. I always laugh at those who say “just focus on the positive” or “you’ve got this”. Don’t get me wrong, I’m a positive person who shares out affirmations to others daily. What I’m trying to make clear, for those who may not struggle with fear or anxiety, is that this isn’t that easy. You can’t just focus on the positive and turn it all off. It’s hard work, but it’s work that is necessary. So today, let’s face our fears and our anxieties together. Let’s walk side by side in this and tell our stories. Let’s rise above and be all who were meant to be.